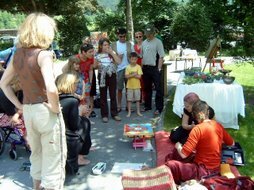 OCPA/UNESCO.org Communicative Art Project International is not for profit and all rights are held by the organization alpswissart. All use and profit from the project without consent is prohibited. The rights for the use and the profit of the local exhibitions organized by member artists belong to the organizers and participants. For artists from different areas and cultures all over the world. The aim is to encourage more communication, respect, and acceptance by bringing all cultures together. 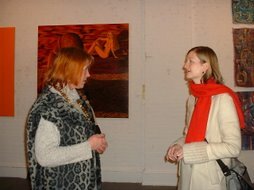 Barbara Streiff, international artist from Switzerland, is the curator of this project. 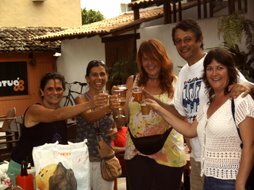 Bahia Artist Jacy Schrepfer by UNICEF is kindly helping with the organisation of the project in Brazil. For the past 20 years, Barbara Streiff has been working as an art teacher with children and students in art and cultural centres all over the world: Switzerland, Italy, New York, Berlin, Cyprus, Asia – just to name a few. Her art courses are recognised by the University of Zurich and institutions in Cyprus, Italy and New York. Bahian artist Josy Schrepfer and Barbara Streiff have conceived this project of art workshops, happenings and street-artwork in Bahia as a communicative art exchange. The artists will go into the streets and public places to work and paint directly with streetchildren, teaching them art through comics. The children will be given assistance (when requested) in painting stories from their daily lives, the wishes and dreams of people today, the fairy tales of their country, or the culture and life in Bahia, for example. All children and people from the streets, will be invited to participate in this project. Donations from tourists and visitors viewing the art action will be used for materials and will go directly to support the children who are taking part in the project. Art exchange will take place wherever the children paint modern Brazilian culture in comics. 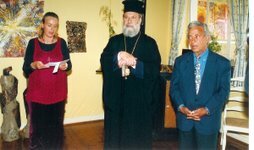 Barbara Streiff's work reflects all cultures, all religions, and all time. Born on 1 August 1955 in Lucerne - the heart of Switzerland – Barbara Streiff spent her childhood in the Swiss Alps in the Linth Valley of Glarus. From her first contact with art at age seven, she began learning traditional art techniques from her family and older artists. Later she studied art at l' École des Beaux-Arts in Paris, the School of Art and Design Zurich, and the Centre of Cultural Heritage in Cyprus, where she also taught. Travels relating to her work and exhibitions have taken her throughout Europe and the world – from Asia to the Arabic states, from California to Africa, and most recently from Cyprus to Brazil. Barbara Streiff's primal geometry art not only reflects the profound meld of nature and human cultures worldwide, but each piece also symbolizes her own personal passion: To further the evolution and transformation of traditional art into innovative and modern forms by communicating with artists all over the world without forgetting the forests of the Swiss Alps.